This sturdy stand will hold up to five different birds. Made from "2x6" and "2x10" stock. 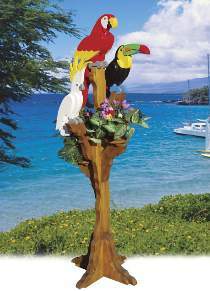 Use to display our tropical birds as pictured, or our Eagle, Owl, Turkey Buzzard or Red Tailed Hawk. All patterns drawn FULL SIZE. Measures 53"H. Plans for the birds pictured are not included. Perfect for displaying most of our large birds, and potted plants and flowers as well!